Enjoy our printable resources to reference at home or present at work to your manager or co-workers! See all that Diabetes Education Services provides, with our new Mini Menu. Enjoy our full selection of offegs with this fun and colorful printout. A checklist version of our 10 Steps to Succeed study guide, give you a printable checklist to following while studying for your CDE. From eligibility to building your study plan to the philosophy of Diabetes, this 10 step guide gives structure to your study path. All Level 1 – Diabetes Fundamental courses have been updated and recorded in January 2018. 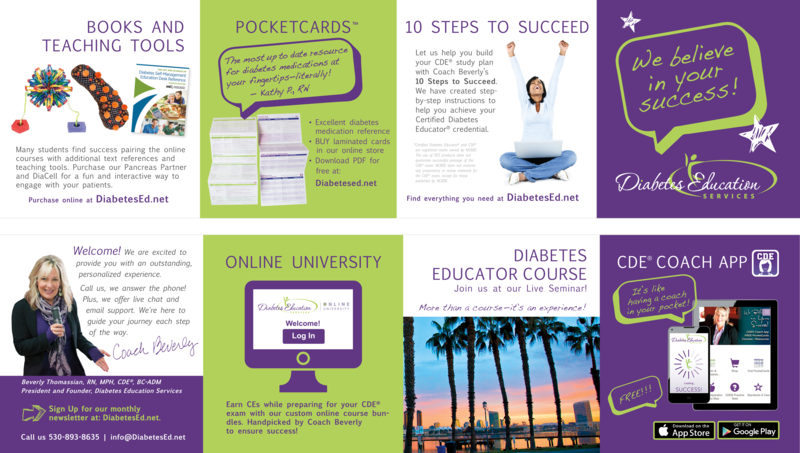 With your purchase of our Level 1 Diabetes Fundamentals, you have instant access to the six On-Demand courses via the Online University, PLUS you have been automatically enrolled in all live webinars for one year after purchase. Join us this winter for the live CDE Bootcamp Series – includes On Demand Online Course Bundle plus live interactive Webcasts. The series of live webinars begins February 2019. A concise listing of our most popular and helpful book and teaching tools. Perfect to print and share. This printable version of our Online Courses Catalog is an excellent reference to present to your manager. With course content, Level descriptions, bundle pricing, you can choose which courses are best for you! Everyone is invited to hear the stories of women luminaries, who have taken risks, challenged the status-quo and were able to turn their ideas into action against the odds. Learn from national diabetes health care leaders and mentors as they share their efforts to improve care. Thinking about joining our Live Seminar? Our printable brochure is an excellent resource to present to your manager. This pamphlet includes course content, presenters, dates, location and much more. Does your facility have professional development dollars to use? Hire Coach Beverly Thomassian to speak! Invest in your team’s success by bringing Coach Beverly to your staff.